eXtensible Business Reporting Language (XBRL) is a standard designed to improve accuracy and reliability in the electronic transmission of enterprise financial data. The standard was developed by an international non-profit consortium of approximately 450 major companies, organizations and government agencies. 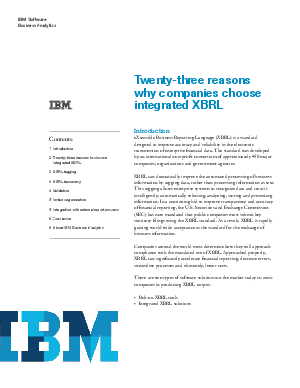 XBRL can dramatically improve the automated processing of business information by tagging data, rather than processing information as text.